Powerful strategies for sales proficiency in ever-changing situationsWhen sales people are promoted, change jobs, or face new business environments, they inevitably need to learn new skills quickly. Their livelihoods depend on getting up to speed quickly; their bosses have no patience for delayed results.Sales guru Jill Konrath offers both new and experienced salespeople a plan for rapidly absorbi… ng new information and mastering new skills by becoming agile sellers. Listeners will learn the mindsets, learning strategies and habits that they can use in crazy-busy times to start strong and stay nimble. 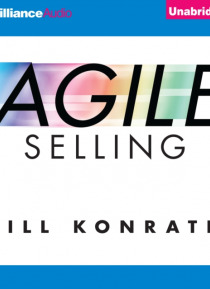 From time management tools to personal motivation and resilience strategies, Konrath teaches sellers how to get more done in less time, regardless of the environment.Listeners who loved the no-nonsense advice in Konraths SNAP Selling and Selling to Big Companies will find Agile Selling equally valuable.